About 35% of those seeking outpatient treatment have been waiting over 12 months. IF YOU’RE WAITING for an eye-care procedure there’s a good chance you’ll be waiting for over a year, judging by new figures. Ireland’s Association of Optometrists (AOI) says that 40,000 people were on outpatient waiting lists at the end of 2017, with 13,812 of those waiting for over a year. Over half of those waiting for over a year were actually waiting for over 18 months. The stats also show that the problem has worsened over the past 12 months, with the number of those on waiting lists up by 21% over that period. A large proportion of those waiting for an eye care procedure were actually waiting for cataracts surgery, according to the AOI. 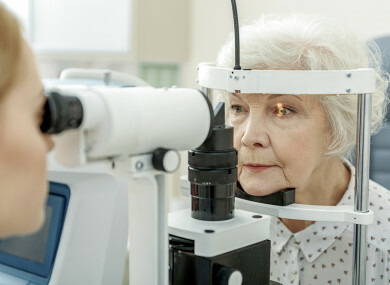 “More than 20% of the outpatient waiting list is related to cataracts surgery appointments. At the end of 2017 there were 8,500 people awaiting cataract surgery alone, with waiting times of up to four years in some parts of the country,” AOI chief executive Sean McCrave said today. The delay in getting cataracts surgery has prompted a range of local initiatives throughout the country where buses of would-be patients are travelling to Belfast for treatment. The AOI is calling for the national rollout of a scheme that’s been implemented in Sligo where care is delivered jointly by ophthalmologists in hospital and optometrists in the community. The group claims that doing this would reduce wait times and could also save €32 million because it is cheaper to treat people in the local optometrist than in the hospital system. Email “If you're waiting for an eye procedure there's a good chance you'll be waiting over a year”. Feedback on “If you're waiting for an eye procedure there's a good chance you'll be waiting over a year”.